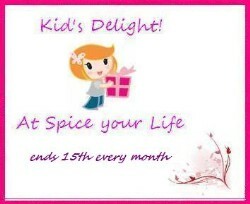 Celebrating Blog Anniversary with Kid's Delight Party! It’s been such a fun ride, with usual ups and downs through the year. So it surely calls for a celebration! The Anniversary celebration is always hosted on my blog to celebrate both the event and the blog birthdays. For the anniversary party, I mostly make an entire menu during this month. However, I do not think I might be able to make it. Still, I am hoping everybody joins in. I invite you all to join me in this celebration. From now until Oct 15th, you are welcome to join me for the celebration with a party for the kids. Entries can be anything that a kid would love to eat at a party. Finally link back to the event’s Announcement page or this page. If you can use the logo, it will be great. Hearty congratulations on reaching a milestone. Eight years is a long time to keep the readers happy and with sustained interest! Happy Anniversary Valli. Wishing you many more happy and successful years ahead.